This book addresses the widely held belief that liberal democracy embodies an uneasy compromise of incompatible values: those of liberal rights on the one hand, and democratic equality on the other. Liberalism is said to compromise democracy, while democracy is said to endanger the values of liberalism. It is these theses that Janos Kis examines and tries to refute. Making the assumption that the alleged conflict is to be resolved at the level of institutions, he outlines a new theory of constitutional democracy. A wide range of problems encountered in constitutional democracy are discussed, such as the popular vote, popular sovereignty, and non-elected justices. Constitutional Democracy is composed of three parts. Part One, "Public Good and Civic Virtue", revisits the debate between liberals and democrats on how to interpret the democratic vote. In Part Two, "Liberal Democracy", the author proves that on the level of principles there is no incompatibility between liberalism and democracy and that liberal theory can demonstrate that democratic values follow from fundamental liberal values. In Part Three, "Constitutional Adjudication in a Democracy", the compatibility of democracy and judicial or constitutional review is analyzed and a theory of constitutionalism is outlined. 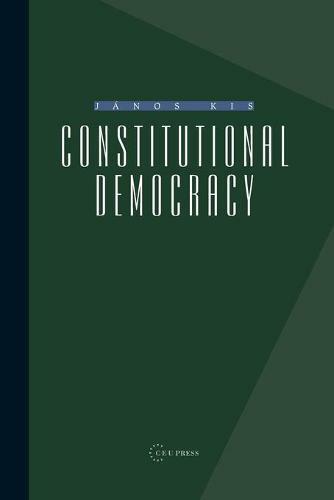 This volume will be invaluable for scholars in political philosophy, political science, and constitutional law, but is also recommended to all those interested in liberal and democratic theory, and the transition to democracy in Central and Eastern Europe.